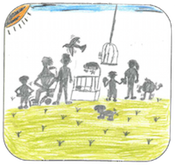 The Victorian Aboriginal Child Care Agency (VACCA) is the lead Aboriginal child and family welfare organisation in Victoria, protecting and promoting the rights of Aboriginal children and young people. We provide programs and services to reinforce Aboriginal culture and encourage best parenting practices, and advise government in relation to child abuse and neglect in the Aboriginal community. We are a statewide Aboriginal community controlled organisation advocating for the rights of Aboriginal children, young people and families, and providing them with services premised on human rights, self-determination, cultural respect and safety.